When Susie Bryant was a young girl in Greenwood, Mississippi she accompanied her mother on expeditions to bring soup and comfort to the sick. She was raised in a home in which education was seen as essential and both parents worked to ensure that children knew their lessons before arriving at school each day. Susie left Mississippi and arrived in Orange Mound on January 12, 1936, with one child of her own, two of her sister’s and a trunk of her belongings. She immediately began what was to be a lifetime of community involvement. In her early days she felt a special commitment to young children. She was director of her church’s youth department, organized the Dunbar Elementary PTA and later kept the children of working mothers in her home. She organized voting sites in precincts all over the city, and has directed “schools” to teach new voters how to go through the voting process. While her activities have taken her all over the city, she is especially noted as an advocate for the citizens of Orange Mound. 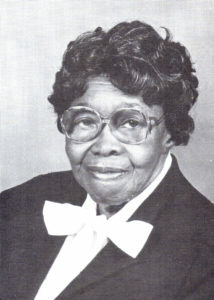 She was vital in the establishment of the Orange Mound Settlement House and has served a long term as president. People in the community know to come to Susie for help in meeting their needs. Whether those needs have been for food, shelter, clothing or love, Susie has found a source. As she herself grew older, she became aware of the treatment (or mistreatment) of older persons in our society and added senior citizens to her list of those to help. Her organizing skills are immense; she has managed to help many individuals by recruiting others to join her efforts. Susie Bryant believes that God will bless you for what you do for others. Because of her steadfast efforts for those in need, her life is filled with blessings.